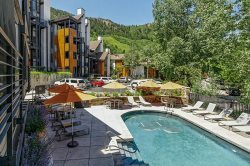 The Ritz-Carlton Club, Aspen Highlands is a full-service facility, ideally situated at the base of the Aspen Highlands Ski Area with true ski-in, ski-out access that is just five minutes from the excitement of downtown Aspen. by making restaurant reservations, booking golf tee times and spa appointments, and arranging day trips. Your Club Concierge is there to ensure everything is as exactly as it should be. Access to exclusive Club amenities extends your home with swimming pools, jacuzzis, a fitness center, kids activity centers, and internet workstations. Grocery Stocking Services can fill your Club residence’s refrigerator and pantry with your favorite foods – prior to your arrival or at any time during your stay.